So in my twenties, I didn't have anything to read. Sure there were books for grad school, and a couple of hundred favorites from my youth, but I would go to bookstores and libraries, and not find much of anything that appealed, and it was sad and I whined a lot. Here's how I changed my life, so that now my Book Needs are met. 1. In the late 1990s, I joined an online group called Girls Own, thanks to my sister who found it first. It is a group of fans of primarily British school girl stories, with lots of recommendations of older girls fiction thrown in. This was wonderful; it gave me lots of authors to look for, and lots of books to buy, especially when small publishers sprang up (like Girls Gone By) who were reprinting some of the scarcer titles. It also gave my sister lots of books to lend me whenever she visited. 2. I married a fellow bibliophile. This resulted in me reading, in the early days of our relationship, books he had lying around that he recommended to me even though he hadn't read them himself yet (I didn't know that until I had read Angle of Repose and River of Traps, with no enjoyment whatsoever, sparing him the pain of having to do so himself). 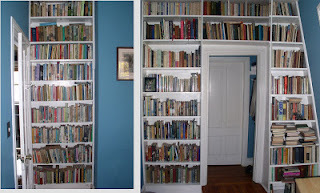 On a more positive note, it also resulted in him building lots of bookshelves in our new home (the bedroom shelves are shown below; couldn't get them to fit in one frame, so the splice is awkward, with half the chimney cut off), and lots of visits to used bookstores in England when we went to see his family there. 4. The Library card catalogue became available on line. Placing library holds became a source of much comfort in the first decade of the 21st century, especially when I realized, admittedly rather late in the game, that authors I liked might have written other books. 5. I started running booksales for the local library around 2000. Not only did this give me first crack at donations, but the library was also just starting to weed the children's books, which had been stagnant since the 1950s, which I also got first crack at. 6. And then the thing that made my book piles explode--I started this blog back in February of 2007. I started reading blogs the fall of 2006, after successfully selling a first edition of Newbery award winner Kira-Kira on Ebay for $300, and realized that Newbery Award book speculation was a sure fire way to untold wealth. The first blog post I ever read was one by Linda Sue Park on what would win the Newbery that year, and that led me to other book blogs, which meant recommendations galore. 7. And when I saw that publishers would send you books to review if you had your own blog, I knew I had to do it...And it worked (except for the untold Newbery speculation wealth part). Hundreds, possibly thousands, of review copies have come my way, and I (and my local library, where many of the finished books have ended up) am very grateful. I have written almost 3,000 reviews. I now review for the B. and N. Kids Book blog too, which has added to my review copy piles. (Here is my first post to get over 1000 views, on Women's Sufferage Fiction. You will notice there are no hyperlinks. It took me almost a year or so to learn how to do those, because I lacked Confidence, but I can now, and that's all that matters. I am a much better blogger now). Incidentally, the book by Geraldine Symons I mention was discarded by the library the next year, and is now safely on my own shelves (proving that my cunning plan to get all the books is working). So now, twenty years after my horrible time of book drought, I will never be hungry again (imagine a book in Scarlet's hand instead of a potato which is what I would have done if I had decent photo editing capabilities. Although I also have lots of potatoes that come up year after year because of my poor harvesting skills, which is also fine). Glad you started blogging and enjoy visiting your blog. Happy Blogiversary from a fellow 'will never run out of something to read' blogger. Hah! Happy 10th. I think you are the only person I know who had Distinct Reasons for blogging; the rest of us just wandered in the door somehow and got stuck. I still have days of whining and discarding all of the books that cross my path as "not what I want right now," but there seems to be a never-ending supply, which is good. Love this post, Charlotte. I am certainly glad that you found your way to blogging. I love that this virtual world enabled us, kindred spirits over books like those by DE Stevenson, to find each other, and even to meet in person. Looking forward to many more book conversations. And I LOVE your bookshelves. Lol! Hard to imagine not having enough books to read these days. Thanks to bloggers like you we are saved from that nightmare scenario! But the best thing is having people to talk to about books: thanks for that. Wow. Ten years! Congratulations. That is quite a feat. 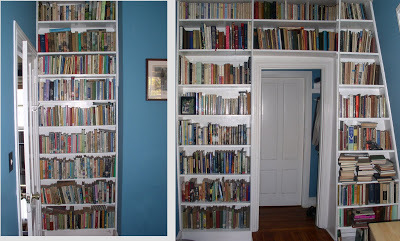 I love the bookshelves. I loved Angle of Repose. My husband and I both read it and had some lively discussions and went on to read other books of Stegner's. I think our favorite was Crossing to Safety. Maybe you will give Stegner another try one day. Thanks for a fun post. Happy 10th Anniversary Charlotte, wishing you many more to come!! I loved the clickbait title!!! Haha. Loved the story in list form, and hooray for ten years blogging! Keep it up. Wonderful stories. Your presence in the blogosphere is a pleasure, and I'm so glad I got to meet you in real life too! Happy belated blogiversary. I am very glad that you ran out of things to read, but even gladder that you started blogging! Glad that you have kept at it! Congrats on your blogging anniversary, and thanks for sharing your interesting story! I like the bookshelves, too.